We understand that as an employer, one key challenge you face is to find innovative, low-cost ways to increase productivity and maintain positive morale within your work force. With 65 years of family owned and operated business experience and 10 locations to serve you, Fazio Cleaners is here to offer you an opportunity to meet this challenge. We are extremely pleased to offer our unique Corporate Services Program to you and your staff. Our mission is to give your employees more time, less stress and quality cleaning second to none. We are confident that, once you experience our outstanding quality and service, this program will become a valued part of your employee benefits package. With our Corporate Services Program you and your employees will receive discounted rates for dry cleaning and laundry services , as well as FREE PICK UP & DELIVERY to and from your office. Our program not only saves your employees time and money but also provides an innovative, low-cost way for your business to differentiate yourself from other corporate competitors. Additional incentives for Human Resources Directors are available! Your dry cleaner should care as much about your appearance as you do. 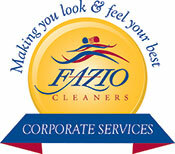 At Fazio Cleaners, we are are willing to go the extra mile so you don’t have to. We are dedicated to helping you and your employees look and feel your best! Please contact us directly to sign up or with any questions! I understand that my orders will be automatically charged to my VISA / MC / Discover account. A copy of all charges will be attached to each order for my reference.